Is there a way to use bookmarks or the buffer list of open buffers to efficiently copy/move marked files/directories to another directory? As an example, imagine I want to copy the files foo.txt and bar.txt from existing location to a bookmarked directory. 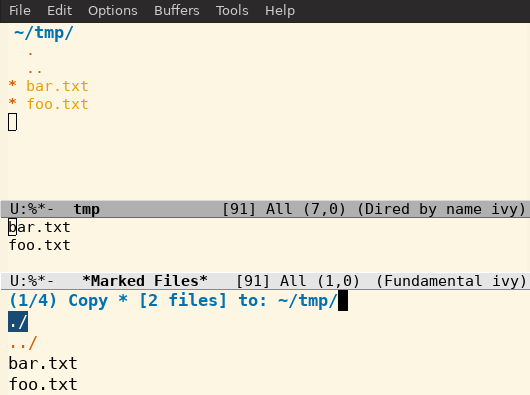 The image above shows the result after marking the two files in dired and then hitting C.
At this point, emacs suggests the current directory as the destination for copying. I know I can impact the default destination directory by splitting the window and having the desired destination directory visible, but that seems like additional steps that shouldn't be necessary. I currently use ivy/counsel/swiper, and thought that it might be possible with that, but haven't been able to find a solution. I would prefer a solution based on ivy/counsel/swiper, but am open to other solutions that make use of dired or dired+ (e.g, ido, icicles). I'm not interested in solutions that involve alternatives to dired or dired+ (e.g., dropping to a shell, ranger, midnight commander). Unfortunately, I don't have the skills to write something like this myself, so I'm hoping there is an existing solution. This seems like the kind of thing that many emacs users would want to be able to do, so I'm surprised my searches didn't turn up anything. Not sure what you want to do, or why, but it sounds like you might just want to write a command that does it. Set enable-recursive-minibuffers to t. (Not needed if you use Icicles. In the Dired source buffer, use R (or C to copy - better for testing). At the prompt, use C-x 4 j d (bmkp-dired-jump-other-window), and choose the Dired bookmark for the target directory. Use C-a C-y C-k in the minibuffer, to yank the target directory name to the beginning of the minibuffer input and delete the default dir name following it. RET, to accept that target directory name. Yes, that's a lot of steps. Not sure it really helps. The point, I guess, is that you can jump to the bookmarked Dired directory (C-x 4 j d) and grab its full directory name (w), then insert that directory in the minibuffer as the target of the move/copy. Not the answer you're looking for? Browse other questions tagged dired ivy bookmarks or ask your own question. How do I prevent autocompletion when trying to save a file?